Literature Wales, in partnership with Head4Arts, hosted a visit to Wales from 3-6 November 2016 for Pierluigi Vaccaneo, co-creator of TwLetteratura and Betwyll in Italy as part of the Tandem Europe project co-ordinated by MitOst. 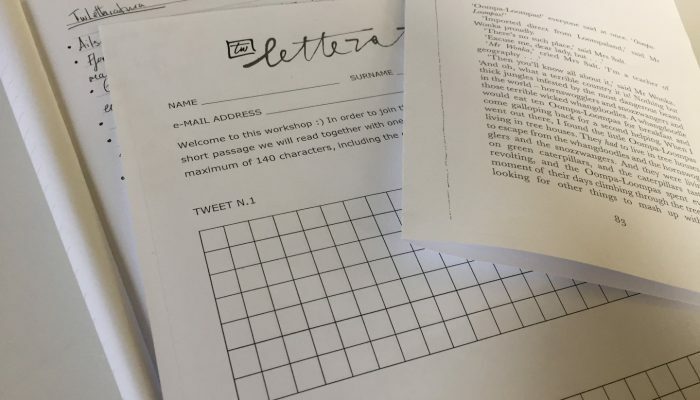 As part of the visit, Pierluigi led three workshops, one each in Llanhilleth, Merthyr Tydfil and Cardiff on TwLetteratura, which uses Twitter dynamics – brevity and sharing – to engage communities with reading, reinventing the readers’ relationships with texts and making it fun. TwLetteratura is one of the 15 good practices enlisted in the manual “Promoting Reading in the Digital Environment”, published by the European Union and written by the work group of the experts in digital reading of the EU States. TwLetteratura uses the platform betwyll to promote analogical and digital reading in Italy and in Europe, in collaboration with all those who recognise the shared values of reading, culture, and freedom of expression. Link with other projects across Europe. Join ‘The Truce’ Project to discover more about migrant stories, shared reading and social commentary. “TwLetteratura croeso! Our Wales experience was fantastic. Head4Arts and Literature Wales gave us the opportunity to share our “methodology” in order to foster and promote reading and literature. Our experience, born in Italy in 2012, is now available through Betwyll, a web app built with the idea to increase the reading experience developing and engaging different audiences. I met cultural managers, readers, librarians, teachers and this gave us important feedbacks and the opportunity to prototype together a specific project dedicated to the Welsh literature”. The beauty of being on the Tandem Europe programme is that I get to meet some really innovative people with some great ideas. When Pierluigi shared information about TwLetteratura, I realized just how useful this would be in Wales so I am delighted that we have been able to organize this series of workshops and I knew that Literature Wales would be the perfect partner to help make things happen here”. Tandem Europe supports new collaborations among cultural organisations to address socio-economic challenges. For the past few years, citizens and communities all over the European Union have been affected by growing social disparities and severe economic backlash. These are difficult years for Europe but also a time full of new possibilities. Unorthodox creative projects have started to emerge all over the EU. They show the imaginative power we need for finding new answers and fresh approaches to the current challenges in our societies. These exceptional cultural initiatives often provide substantial meaning to people’s lives. We believe they can also help to initiate broader social and economic innovation processes.